My aunt is an amazing lady who always has a way of making every person she meets feel like they are extraordinary. Thanks for the video. They must be time consuming to make but they sure make directions clear for us. Loved the card and the use of the magnetic masking material. I will have to try it. There are so many women to whom I need to say thanks and love you: to my “daughter”-in-law, Karey, who is the best Mommy to my “little guys” and true love to my son; to my “Sistas”, my close friends with whom I worked and with whom I still maintain close contact; with my other strong women friends, from whom I am able to sustain my strength to nurture others; to all the amazing artists, scrapbookers, and cardmakers out there from whom I have learned SO much!! Thank you! I like that technique and the magnetic sheets are pretty cool. Another awesome technique to try! I am in love with creating all over floral patterns right now. The cards were just lovely and always a delight to watch your videos. Great cards and technique. My grandaughters love pink and purple. Love your blog! Wonderful ideas! Fabulous application! Thanks for sharing. Very beautiful. How beautiful! thanks for the hints!! Your cards are so bright and beautiful. Your pink and purple designs are amazing. Thanks for sharing your techniques with us. To my amazing Mom, you should see this cool new technique. Love the vellum technique – with masking and sponging. LOVELY! Love this new release from Ellen Hutson! Julie is so amazingly talented! Beautiful projects today. Thanks for sharing. To Pam: The encouragement you gave me as a child, made it possible for me to conquer many challenges throughout my life. Sandy, your cards are beautiful with those colors. Thanks for the video. My mom is one woman who continue inspires me to be a better mom and wife. She is sweet, patient, good cook and always encouraging. She lives in a different country and it’s been 6 years! I cannot wait to see here and give her a BIG hug every day in person this Summer. Awesome! Love the techniques that you shared. Can’t wait to give it a try. Sandy, thank you so much for the video! It was so helpful – makes me rethink vellum. Lovely card! To my mum: YOU ARE THE BEST MUM! For you Sandy, as usual great job. Your videos are great. I watch them all and have learned quite a few things with them. Thank you for teaching me! You are truly one of the greatest mothers that I have ever known. Thank you for raising my nieces to be the incredible people that they are (and my brother)! Love you SIL! beautiful results! vellum has always been intimidating to me, maybe I’ll try this technique- thank you! My mom is the most amazing woman in the world. Without her me and my brothers wouldn’t have gotten as far as we have. We love you mom!!! Thanks Sandy for the fabulous video – now off to try this technique. You are so amazingly creative, thank you for sharing your talent. Thank you for sharing your technique video! Just love this. I never quite know what to do with vellum. Thanks for the inspiration. 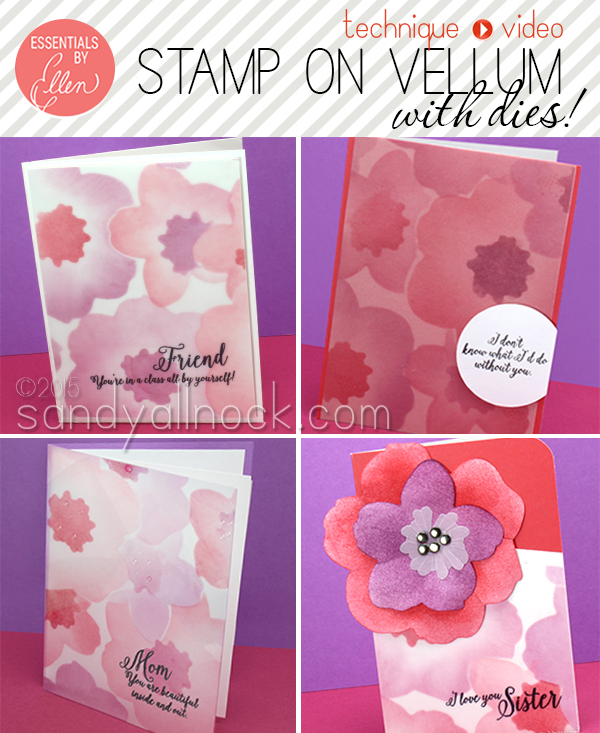 Great card, love the use of vellum but, that craft assistant is amazing. Thanks for the share! Awesome tutorial. I love the fact of coloring on vellum. Vellum runners don’t work really any better than what you did here, as far as hiding adhesive in my opinion… Love these flowers. Gorgeous, gorgeous, gorgeous…….. Thank you for sharing this technique, Sandy. Your creations turned out wonderful!! Great release! Can’t wait to get some. Gorgeous cards Sandy. I love the softness of the colouring on the vellum BeYoutiful. To my sister – Narelle I don’t know how you get right back up on your feet every time you get knocked down but you do – you are amazing. Just beautiful! Thanks so much for sharing. And thanks for including the tips for fixing the things that didn’t go so well! THAT is what helps us beginners so so much. I was wondering about your paper trimmer. I think I would like a guillotine type trimmer, but just a small one. Didn’t see it in the products. And thanks for the chance to win this wonderful product. Thank you so much for sharing your techniques for stamping on vellum, love your card. Friends are like flowers in the garden of life. Thank you for being in my garden! Great video. thank you for the instructions. Awesome giveaway! TFS! I love the cards! My sister is amazing! She is forgiving and fun loving and is always there for a good chat when you need it!